At the age of 22, having just finished college, Ben Jordan found that International Relations, in which he had his degree, was not what he wanted to do with his life. Against the opinions of his family (save for his grandfather who alone supported his chosen interest) he began a career as a freelance paranormal investigator. His first two cases both took place in his native America, which is what might be expected for someone just starting out in the field. He acquitted himself well in both of those; in the first he tracked down the Skunk Ape and undid the cause of the Skunk Ape’s unusual behaviour, while in the second he rescued a man who disappeared while searching for Lost Galleon of the Salton Sea. These performances notwithstanding, a call from Scotland, asking the paranormal investigator to uncover the secrets behind the murders of two small children, thought to be the work of witches, is unexpected – Ben hadn’t thought to have any international cases so early in his career. Nevertheless, he accepts the case, and books a flight to Scotland, his destination: the small town of Smailholm. In Smailholm he will discover a mystery deeper and darker than either of his past two cases. This is a case in which he will become personally involved, and two of the people that he meets will have a great impact on his life. This story is a definite improvement on those of the previous two games, in my opinion. The characters (aside from a few supporting characters) are now more believable; not everyone tells the truth, those who are trusted may betray our hero while those at first disliked may prove themselves allies at the end. What’s more Ben will begin two relationships of great importance to the story arc over-arches the series, one personal and professional, the other very personal. The writing of these parts, while not perfect, does, I feel, portray the characters and their situations effectively. What’s more there seem to be fewer characters placed for the purposes of providing information or an item, rather than being a part of the plot. The graphics that support this story are acceptable; while not the best that I have ever seen, and at times poor, they on average seem to me to continue to improve a little on those of this game’s predecessor. The music retains the quality that it had in the previous games. It is often good, evoking an appropriate atmosphere to the scene in which it is found, from the homely and comfortable feeling of a cottage to the eeriness and tension of supernatural danger. One place that shows marked improvement is the introduction to the game. In the previous two cases, this took the form of a few words describing Ben’s situation until that point, followed by a scene in his bedroom in which he received the telephone call that summoned him to the case in question. While the telephone scene is still present in Ben Jordan 3, it is prefaced by a scene set under a bright full moon, in which we learn that Ben is expected in Smailholm, by others than those that he might like to expect him. The interface remains for the most part unchanged from Ben Jordan 2. The gameplay is almost entirely mouse-driven; one puzzle calls for the use of the keyboard, as does entering names for saved games. 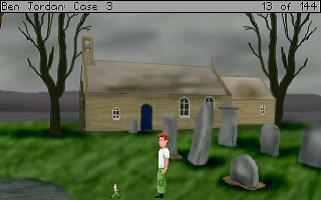 The player directs Ben via the left mouse button, with the type of action intended being determined by the mouse cursor at the time. 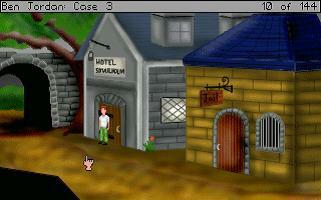 The mouse has available four main cursors, indicating walking to a spot, interacting with the world, examining Ben’s environment and talking to people, represented by cursors in the form of a miniature Ben in mid-stride, a pointing hand, an eye and a speech bubble containing an exclamation mark. These cursors can be selected in two ways: via an icon bar that appears when the mouse is moved to the top of the screen, where they are selected via the first four icons from the left, or through simply clicking the right mouse button repeatedly until the desired cursor is found, as right clicks cause the mouse to cycle through the available cursors. Also available via the icon bar is the inventory, represented by an icon of a pocket. When clicked on, the inventory is displayed for the user’s perusal, and, if desired, examination. 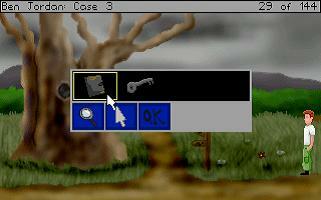 Selecting an item in the inventory makes its image the active cursor, indicating a fifth type of action: that of using an item in the world. If so desired, once selected (and until something occurs to deselect it, such as using the item or selecting another) this cursor is also available through right clicks. Again carried over from the last game is the notepad, which can be opened via yet another icon on the icon bar. As before this causes a white “page” to appear on the screen containing Ben’s notes on the case. While they are a little sparse in some places, where the player is effectively without their use as a reminder, since no new notes have been added, they are perhaps a bit better than in the last case, and may be found to be useful for what they do cover. A nice touch is found in the details to be found in the surroundings, which Ben can look at, but which are not directly relevant to the story. In addition, some of these can even inject moments of mild levity into the experience, which can be welcome in the otherwise quite serious mood of the game. Another nice feature is found in the fact that Ben Jordan 3 features two slightly different endings, found via a branching of the story towards the end and having a different set of puzzles. Ben discovers much more in one of these endings, but it is nevertheless fun to play the other, shorter path as well – and if the shorter path is found first (and it is the easier of the two to find oneself travelling down, I would say), the presence of the longer provides incentive to replay at least the end of the game to discover more. Whichever path is taken, the creator of Ben Jordan 3 has been kind enough to mention the presence of an alternate path once the game is done, thus reducing the chances that people will not realise that there are in fact two endings. One final feature of note is not, in fact, in the game itself, but rather comes with it. 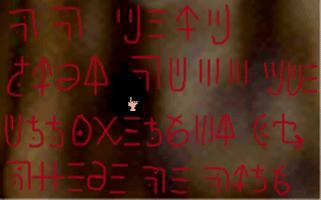 This is the Paranormal Investigator’s Handbook, or rather an excerpt therefrom, covering the subject of witches. This provides interesting information and background, as well as useful clues for two of the puzzles (albeit indirectly for one of these), as well as a small amount of foreshadowing. The Handbook is a nice addition, with writing that, if not wonderful in my opinion, is acceptable I feel. 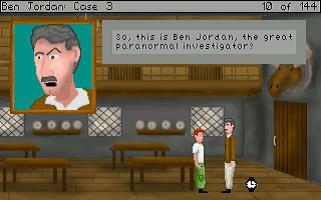 The puzzles encountered in Ben Jordan Case 3 are, I would say, better than those found in the previous two games. I found them both fun and interesting, especially enjoying the two examples of the “Witch Code” encountered in the game. They are for the most part inventory-related, with conversations providing some points and deduction having a small place too, and are on the whole not terribly hard. On the negative side, I found one object to be a little small, and three others (two of which are found at once, making for two instances) to be perhaps a little inobvious. It is perhaps worth noting that it is possible to die in the final scene; if this happens the player is returned the a point just before the dangerous encounter, allowing the player to attempt to overcome the problem without reloading a saved game. 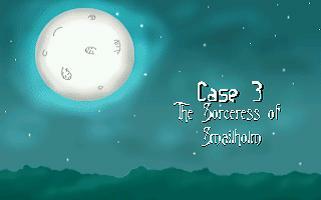 In conclusion Ben Jordan Case 3: The Sorceress of Smailholm is a good game, and, I would say, a definite improvement on its predecessor. It appears to be the point at which the major story arc of the series as a whole begins; Cases 1 and 2 seem to me to be effectively interactive introductions to the character and his world. 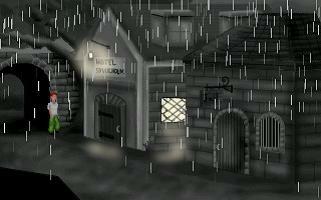 Furthermore it develops a more interesting and, for me at least, immersive atmosphere than do the previous two games. While the graphics are still not a highlight of the game, they do seem to be improving a little, slowly over the series, and the music remains a more positive aspect of the game. Overall, I found the game to be very enjoyable. Ben Jordan 3 is of moderate length, is free to download, and at 26.5MB is not, I would say, too large for those of us still using dial-up connections. 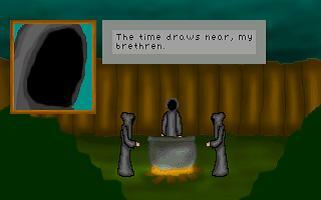 Given all of this, this is a game that I would recommend to those who enjoy supernaturally-themed adventures.